Just a note to my readers to say that I’ve been working hard on de-kinking my website as well as putting together two new portfolios. I’ll be introducing the first one either later today or over the weekend. I’m also doing research on an exciting new technology which I think is going to have significant impact our entire lives–from the way we light our homes to how we watch TV to how we read books and newspapers. I’m working on identifying the companies at the forefront of this technology and will report on it shortly. Great stuff so please stay tuned! This is a valid recipe but I failed to mention one major ingredient—market direction. If the market is trending upwards, then taking long positions on companies that beat analyst estimates and holding onto them up until their next earnings release generally provides positive returns. What I failed to look at was what happens when the market is trending in the opposite direction–does that have any impact on the strategy? Yes, it does. Take a look at the price movement of Myriad Genetics (MYGN) shown below. You can see two humps (for lack of a better word) appearing in its daily chart since November. I knew when I saw them that they were most likely the result of blow-out earnings and I was right. On 2/3/09, the company reported 43 cents/share as opposed to analyst estimates of 32 cents, and on 11/4/08 they reported 30 cents/share as opposed to an estimated 14 cents. But if you had played the earnings after each announcement expecting a big pay-day, you might have been disappointed. The chart shows that investor euphoria only lasted about a week to a week and a half before the stock retraced back to its trend line. Don’t get me wrong–had you held the stock since last November, you’d be sitting pretty, but that has more to do with the company’s products and fundamentals rather than momentum. Compare this chart with that of the S&P 500 and you can see a rough correlation between the stock’s price and the trend of the overall market. Yes, Myriad has moved up while the market has moved down, but you can see how relative movements in the broader market influenced the movement in the price of Myriad. I think that if the broader market had been trending up instead of down, Myriad would be trading at a much higher price than it is now and the trend line in the chart might then be situated at the high points of the humps instead of well below them. To those of you who might have been following my post-earnings strategy, I truly apologize for the lack of foresight in including market direction as a fundamental ingredient. Cooking without it can make for some unpalatable long-term returns. If you do wish to play this strategy against the market grain, I strongly recommend taking a quick profit as your gains could evaporate faster than an AIG executive’s bonus. Note: I’ll be modifying Recipe #12 to reflect this discussion. I’m busy working on two new portfolios that will be introduced shortly which is why today’s blog is rather thread-bare. But I do want to alert all of you who are following my M&A portfolio (MANDA) that portfolio constituent, Aladdin Knowledge Systems (ALDN) today completed its merger with private equity group Vector Capital. Aladdin shareholders will receive $11.50 in cash per share. This represents a 5.3% return on the trade. Overall, the MANDA portfolio is up 2.6% since 6/26/08 inception. Compare that with -37% on the S&P 500. Woo-hoo! Here’s the list of all open and closed MANDA trades since portfolio inception. Can extreme values of the Trin predict a market reversal? In last Wednesday’s blog (“Beware the Bull Trap”) I mentioned that extreme values in the Trin, aka the Arms Index, typically precedes a market reversal. High values signal a short-term bottom and low values a short-term top. According to one article on trading with the Trin, the author states that extreme values in the Trin signal a market reversal roughly 90% of the time. I know from extensive experience day-trading the index futures that extreme values in the Trin generally do precede a market reversal, but I wanted to see for myself what is that correlation. Looking at the other extreme (Trin >2.5), the bottom table shows a similar success ratio for both the opening and closing trades. Had you bought the SPX on the close, you would have profited quite handsomely–over eight and a half points on average!–by holding your position until the next day’s close. In fact, selling on the next day’s open is a break-even proposition at best in this scenario. Although there are only 16 data points in one case and 29 in the other, I do believe that’s enough data to infer that extreme Trin values can be used effectively to trade market reversals. High Trin values especially lead to greater profits, and I think that futures traders stand the most to benefit from this strategy. Of course, judicious application of appropriate risk management techniques can reduce loss in those cases when the market doesn’t move as expected as no S&P futures trader wants to get stuck with a 59 point loss! A quick blog today as I’m in the midst of doing some new research as well as meeting with my website programmer. BTW, the new site is looking absolutely fabulous and will hopefully be up and running within the month. Yesterday I noted that the excessively high positive levels in the VWAPs combined with the extremely low value in the Trin (Arms Index) pointed to a lower opening today. That did not happen as most of the major indices opened up, but my forecase wasn’t completely off-base as most of them drifted lower as the day wore. The Trin roughly mirrored the opposite movement hitting an intra-day high of over 1.60 (compare that with yesterday’s values between 0.3 and 0.5). There’s still more than a half hour to the closing bell. Barring an eleventh hour rally (which can happen), all of the indices look poised to close down on the day (around 1% for the S&P and the Dow 30). The oil, gas, solar energy, coal, and metals (gold, silver, aluminum) sectors rallied nicely today with many issues gapping up strongly on the open and rallying off of multi-year lows. The drillers especially look good. Here’s some that broke out of their bases today: Berry (BRY), Dril-Quip (DRQ), Diamond Offshore (DO), Murphy Oil (MUR), and Ultra Petroleum (UPL). In the gold sector Randgold (GOLD) is nearing its all-time high set almost a year ago. The stock has already rallied 67% from its October low and its chart is showing no signs of slowing down. Bank and brokerage stocks have been rallying along with the overall market and a good question to ask is if this rally is genuine. The XLF, the financial ETF, is trading around $8.80 and the regional banking ETF, the RKH, is about $53.50. They’re both getting close to overhead resistance which they need to break through in order for this rally to have any legs. 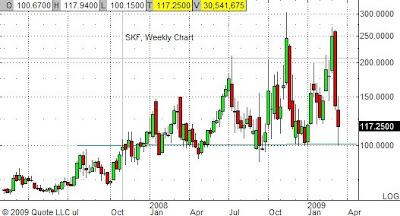 A more visual way of evaluating the status of financials is to look at the ultrashort financial ETF, the SKF. The chart shows strong support at $100, a level it must break before the financials have a even a hope of rallying. Beware of the bull trap! Today’s market action seemed to echo the words of Robert Browning: “God’s in his heaven, all’s right with the world.” Buoyed by AIG CEO Edward Liddy’s promise that some of the $165 million in employee bonuses would be returned to taxpayers (and the ones who won’t be returning theirs will at least have to give back a portion of it in income tax) along with the Fed’s promise to buy more mortgage backed securities and long-term Treasuries, the market was bathing in a sea of green. Pretty much every sector was up, including emerging markets and gold. There was a noticeable absence of decliners, although the dollar took a tumble. The VIX (volatility index) also closed down but still slightly above support at 40. So, is now the time to take the money you’ve been hiding under the mattress and go long? Maybe, but I don’t think so. Today’s action was almost too good to be true and I’m betting that tomorrow’s action won’t be quite so rosy. The Trin is an acronym for TRading INdex. It’s a technical indicator developed by Richard Arms. Because of this, it’s also referred to as the Arms Index. The Trin is easy to understand. It’s given by the following equation: Trin = [# of advancing issues/# of declining issues]/[volume of advancing issues/volume of declining issues]. For the past week, the market has risen as the Trin has fallen. Yesterday, it hovered in the 0.4 – 0.6 range and today it fell even lower, closing just above 0.30. This is a strong signal that tomorrow’s open will be lower. The Volume Weighted Average Price is a trading benchmark commonly used by institutions. It’s calculated by taking the weighted average of the prices of each trade. What it really measures is how much interest (or lack of it) there is in a stock. VWAPs on the order of 0-80 are mildly bullish; 80-150 is bullish; and 150+ is very bullish. Stocks trading below their VWAPs are those that traders are trying to unload. VWAPs from 0 – -80 is mildly bearish; from -80 – -150 is bearish; and below -150 is very bearish. Today we saw positive VWAPs in the +200 to +300 range and virtually none on the negative side. This is another indication that stocks may be over-bought in the short term. The moral of the story is that it might be a good idea to sit on your hands for the next few trading sessions. My stance won’t turn bullish until the VIX moves and stays below 40, although I’d really like to see it break 35. Remember that we’re not even half way through this credit crisis and there’s still a lot more pain to come in residential and commercial mortgage-backed securities and in the consumer credit space. All is not right with the world just yet. The IMN Distressed Debt Summit commenced yesterday in Dana Point, California under sunny skies and mild ocean breezes. In IMN’s words, the purpose of the conference is to “provide a forum to explore investing in funds focused on distressed equities and debt to review how public funds and institutional investors aim to capitalize on the hottest strategies emerging in today’s equity and debt markets.” Many pension and wealth management funds are down by at least 20% and managers are searching for new ways to make up that deficit. To this end, seven moderated panels were held with the morning sessions shared with the IMN Public Funds Summit being held concurrently. Panelists drawn from state pension funds and investment management firms discussed topics ranging from identifying distressed debt opportunities to taking advantage of severe dislocations in the structured credit markets. To be sure, the topics covered in these sessions were highly technical and diverse in nature but there seemed to be several themes that kept surfacing throughout the day. Right now, he likes senior secured first-lien bank debt as the best alternative to equity investing citing implied ownership at cheap rates–on the order of one to two times cash flow. Other panelists offered their own ideas. Beth MacLean, a leveraged loan portfolio manager at Lord Abbett, likes the debt on solid BB companies saying that they’re trading at 80% of par due to virtually no demand. Michael Flaherman of New Mountain Capital uses a defensive growth strategy of buying companies in acyclical spaces claiming they do well in all economies. Prakash Dheeriya, a finance professor at Cal State Dominguez Hills, takes a more novel approach by suggesting investments in “distressed” assets such as movies (a la Slumdog Millionaire), sports teams, governments, and currencies. Many managers said that they are starting to buy at the top of the capital structure (AAA and AA rated securities), and it will be a while before they touch commercially-backed paper. John Pluta of Declaration Management & Research likes senior class non-agency prime residential mortgage-back securities. What he does not like is government mandated loan modification programs claiming that they increase risk. His fellow panelists shared his sentiment. Another panelist, Ed Burton, a trustee of the Virginia Retirement System, claims that all risk is priced too low. “Now is the time to take on risk,” he said, further stating that his pension fund is very liquid and is able to take on new positions. To him, stocks and debt instruments all look attractive because he feels they are grossly undervalued. He is especially fond of big companies with huge cash reserves. Microsoft, anyone? Other panelists liked the area of DIP (debtor in possession) financing which is a type of financing extended to companies in the throes of bankruptcy. This type of debt instrument is very attractive now but one needs to sort through them very carefully. Do you know the difference between a CDO and a CLO? No? I don’t either and neither do many financially savvy folks which is why many panelists stressed the importance of selecting a good manager. By their definition, a “good” manager is one who has a long, solid track record in dealing with these complex financial instruments and ranks in the top quartile by performance measures. Naturally the panelists working in this area included themselves among that select group. (No egos here!) But I must say that the trouble in finding the right ones can reward the investor with gains in the 20-30% range which is impressive in any market and even more impressive in this one. In regards to the previous point on market timing, several panelists pointed out that managers are more adept at market timing, yet another reason to find a good one. Irv Lowenberg, the treasurer of the city of Southfield, Michigan, has his own take on managers. He prefers to invest with the rising stars in the industry as well as the established stars. There are a couple of caveats to the task of selecting a manager. Panelist Michael Levitt, Chairman & CEO of Stone Tower Capital, worries about what he terms “style drift,” or a deviation in a fund manager’s investing style. He says that style drift has become a problem lately as managers try to make up for lost returns by investing outside their areas of expertise. I’m not sure how one can discern if a manager is deviating from his or her investing guidelines, but it’s something to take note of. Another caveat is in credit analysis. Some managers admitted that they do their own credit analysis instead of relying on the credit agencies such as Moody’s. Many point their fingers at the credit agencies as the creators of the credit crisis so I certainly can’t blame the managers for wanting to do their own analysis but the burning question is do we have any assurance that these managers are doing an accurate job? Echoing Jim Cramer, many panelists stressed the importance of portfolio diversification. In the “Weathering the Economic Turmoil” session, the panelists (all of them representing pension funds) agreed that their portfolios would have suffered more had they not been diversified. However, diversification can’t solve every problem. Bob Jacksha of the New Mexico Educational Retirement Board admitted that his absolute return strategy didn’t work even with the inclusion of hedge funds. There seems to be terrific opportunities in the distressed debt arena but the complexity and availability of the instruments involved is out of the reach of the retail investor. Right now, the professional consensus is that getting into the top of the capital debt structure offers attractive returns even in worst-case scenarios. The bad news is that the equity market won’t shape up until the credit market stabilizes but the good news is that many conference participants see the beginning of credit stabilization. You may see from the new sticker at the top of the page that SeekingAlpha has granted me their seal of approval. Yay! 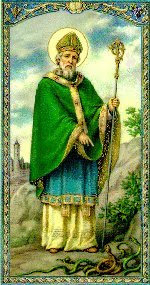 Begosh and begorrah, I almost forgot it’s St. Paddy’s day. How much fun is green beer? While the teacher is gone, please don’t give the substitute too much grief, okay? You are currently browsing the Stock Market Cook Book blog archives for March, 2009.